In our ongoing efforts to connect historical struggles to our present reality, on Saturday March 4, the Caribbean Solidarity Network, Caribbean Tales and A Different Booklist will be co-hosting a screening the documentary “70: Remembering a Revolution” – focusing on the legacy of the Black Power Revolution in Trinidad. The film will be followed by a public discussion forum. 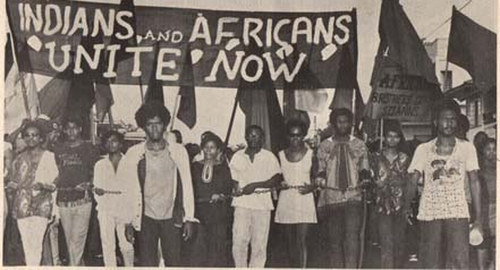 The documentary explores how protests against Canadian racism by Caribbean students helped inspire political action against neoimperialism in the Anglophone Caribbean. The goal of the event is to raise awareness of Canada’s connection to the Caribbean Radical Tradition, and spark a conversation about how to strengthen the political voice and organization of our community. There will also be an opportunity to sign up for the Caribbean Solidarity Network’s Action Committee and new community reading group.